Cats are known for being disinterested, aren’t they? But do they really remain indifferent to the emotions and health of their owners? 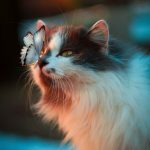 Let’s find out in this article if there is a secret power that makes cats sense illness in humans. Cats sense illness: true or false? Why would a skeptical person believe that cats sense illness? Do they have some super secret power? How can beings who can not speak have such an important skill? We are always saying that cats are amazing animals. They have developed spirituality and are part of the mystical world like no other pet. In addition, their extrasensory perception is very sharp, which leads us to believe that cats sense illness and even death. If there was only one aspect to at least try to prove that cats sense things, we would say: their focus in the now. Have you noticed how cats are always calm and serene? They seem to be in a constant meditative state. We all know that meditation and mindfulness are a relief to our mind, allowing us to focus on what matters most. Perhaps because the mind of a cat is not so easily confused with mere distractions, it catches more serious things like the presence of a disease, for example. Allied to the spiritual and psychic powers of a cat, there is another one: the smell. All cats have very sharp eyesight, hearing and smell because they are essentially hunters, long before they are pets. As smell is considered a superpower, cats are likely to sense illness and emotions even before you. But how is that? Our body is constantly changing. We breathe, our blood runs in our veins and at all times it is producing hormones. If there is an imbalance in the normal functioning of our body, it will secrete substances that we would never perceive at first, but a cat would. So this is already a good point to believe that cats of sense illness. The smell is an important tool for cats sensing illness in humans, but their sensory perception also helps. Cat owners may say that they ignore when they call them in loud voice, but the truth is they are aware of everything. If you have a cold and fever, you may find that your cat has detected that you are sick because it probably will not stop prowling around you. In these days, your cat can be more affectionate and present. Yes, your pet may have a lot of love for you but the truth is that it has also been able to detect that your body’s temperature increased and wants to take advantage of your warm body. While many people report that their cats notice when they have a cold, so many others say their animals helped them detect cancer and other more serious illnesses. There are no proven studies and evidence on this, but the most famous stories were that of a man in Canada who discovered a huge tumour in his lung. All because the cat did not stop putting the paw on the affected area for many days. The other case was about a woman in Tennessee who decided to go to medical care after her cat jumped incessantly to one of her breasts. The diagnosis she received was of breast cancer and the doctor was able to detect it at the beginning, thanks to the attention of her cat. Whether it is proven evidence or not, it is better to pay attention to what your cat has to say. They are, indeed, very wise animals!